If You See Him Album reviews. The ridiculous title of this album comes from the number one song, "If You See Him/Her" a duet with Reba's touring partners, Brooks and Dunn. According to them, there was a quarrel because both acts had heard the song separately and both had different plans for the song. Arguments ensued, then came the brilliant suggestion that the song become a duet. Upon hearing the final product, one can only wonder what's the big deal? Which, coincidentally, is the same question one could ask about this entire album in general. Other critics have called it a wonderful album, saying that it is her most country in years. Which makes me wonder if they listened to the entire thing, especially "Forever Love," the second single, or "All This Time," both of which are mushy love songs about beating the odds and having lasting love. Think "Look At Us" five times slower with inferior lyrics. But since this critic doesn't really mind if her country is a little bit rock and roll, that isn't what I find so bad about this album. What's bad is the songs themselves. Granted, they aren't horrible, but they certainly aren't great, either. Take for example "Invisible," which is a song about a woman who meets Mr. Right, marries him, and has a baby. Well, after the baby is born, guess what? She feels... invisible! How many "you used to love me until I had a baby" songs are there in country music? If one really wants to listen to them, one is better off buying Lorrie Morgan's "Something In Red" CD. 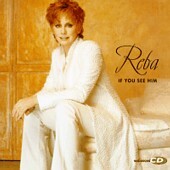 If the songs on "If You See Him" aren't predictable or boring, they are out of Reba's range. Honestly, who wants to listen to a forty-ish year old woman singing about not being able to find a man. That's utterly depressing for all the wrong reasons. After all, if she can't find anyone, then how am I supposed to? Part of the problem is the producer, David Malloy. He produces Mindy McCready. At least two of the songs on this album, "I'll Give You Something to Miss," and "One Honest Heart," have Mindy stamped all over them. I'm not saying that Reba doesn't have range. On "Wrong Night," Reba takes a Mavericks styled tune and makes it all hers. Not everything on this album is bad. In "Lonely Alone," Reba gives one of her best performances ever. The album also features one of the best songs ever written about the one who got away, a clever little song intitled, "Heart Hush." The simplicity of "Up and Flying," is hauntingly beautiful. Alas, the few gems which pop up here and there are not really worth buying the album for, unless you are a die-hard Reba fan.